Analysts said the resulting rise in risk aversion had led investors to exit carry trades, in which the purchase of riskier high-yielding assets is funded by selling low-yielding currencies such as the yen. Does the value of the United States Dollar concern you? Find out how recent trends have contributed to its decline. Countless geopolitical factors have had an effect. China has rapidly accelerated its monetary situation. Asia as a whole holds the foreign reserves ransom while the region regroups from its mid 90s financial debacle. And the Euro, not even a decade old, continues to strengthen—the currency is the newest and hippest kid on the block. Has the dollar’s disease quickened due to Bush administration actions or was the economical situation a historical matter that the latest White House only inherited? How much has the trip-up cost the U.S. currency its reputation among the foreign exchanges and have other more eligible currencies turned the heads of foreign reserve managers? Countless comparisons have been made between Bush and Clinton economics. The two dovetail temporally, but diverge ideologically. Clinton critics are eager to find fault first with his Administration. Statistically, when the graphs are all done and the brightly colored pie charts printed out, the Clinton administration managed to come out ahead in regards to overall economic strength. But most of this euphoria was based on domestic economy. The fact is that neither Clinton nor Bush managed to improve the overall trade deficit; both ran it into negative territory.1 And while other robust factors have added combustibles to the fire, the trade deficit is a multi-faceted issue that figures prominently in the assessment of the USD value equation. As much as trade is now a specter in currency value, it hardly functions on its own. Economic pedagogy teaches us that a strong domestic economy in any country makes for a more stable currency. Clinton did in fact produce favorable results in jobs, unemployment, national debt, poverty, and important economic factors like property ownership. Under the Bush Administration, every indicator but Productivity has slipped significantly. Fewer Americans are able to own homes, more are without health insurance, household incomes have fallen, and the number of well-paying full-time jobs has decreased.2 Add to this the alarming reversal of national debt and the recipe is one of economic volatility. Absolutes that have devalued the dollar are the Iraq War and gas prices. These taken together provide the traditional economics for a weak dollar. The war has contributed unheard-of debt. The only reason, according to many economists, that the U.S. has any global monetary power is the fact that so much of the foreign reserves are still heavy with U.S. greenbacks; in this lies dollar value. The Yuan, the unit of Chinese currency, has affected American workers, whether they know it or not. In many cases, when jobs have been cut, especially in areas heavy on manufacturing, international trade issues are to blame. Just look at the growing influx of Chinese products. China’s currency in technical juxtaposition to our own has deeply undercut the U.S. dollar value and concurrently dealt an upper-cut to American international trade, state the charges from the White House. Accounting by the European Central Bank shows that as of 2006 the share of reserve currencies, distributed among the international coffers of the world’s exchanges and banks, looked like this: U.S. dollars accounted for over 65%, the Euro over 25% and the sterling pound a bit over 4%. Not far behind the pound, the Japanese yen weighed in at just over 3%. “Other” currencies made up 1.5% and the Swiss franc accounted for .2%. The larger context, though, shows trends that underscore a diversification of reserves. For example, the reserve of U.S. dollars reached its peak in 2001 when it consumed 70.7% of the total. While it has experienced mild fluctuations since, by far its largest drop was from this high in 2001 to its rank in 2002—it thudded to 66.5%.10 At or near this level the USD reserves have vacillated since. In contrast the Euro has gobbled up increasing bite-sized chunks of the total reserve pie. On January 23, 2007, a Market Watch headline proclaimed: “The dollar fell to a 14-year low against the British pound and two-week low versus the euro Tuesday, on growing expectations of further interest-rate hikes in Europe and as oil prices rebounded.”11 Headlines such as this may not be so uncommon in the future. The currency remains remarkably well received among governments whose goal is to diversify their portfolios of foreign reserve currencies. For a short-lived period of time the GBP was displaced by the Japanese yen in the top three foreign reserve currencies, but has since regained its spot among the leading power currencies. Like China, Japan has vigorously stockpiled dollar denominated currencies in its foreign reserve since the Asian financial crisis of the 90s. Neither Japan nor China were as significantly impacted as the East Asian countries, but still their best defense to any further economic tremors was to fatten federal reserves full to the rim with U.S. dollars. This has been most measurable since 2000. As of 2004, according to the Federal Reserve Bank of San Francisco “[Total] worldwide foreign reserves holdings reached $3 trillion…up from $2.4 trillion in 2003,” with the biggest coffers belonging to Japan first and China second.20 Regardless of the size of Asian reserves, the yen poses little challenge to the value of the U.S. dollar. Perhaps one day it will. Already the yen has made small advances in international portfolios, but it undoubtedly is much weaker than the leading currencies. The results are in on many economic fronts. The U.S. dollar has had its heyday. 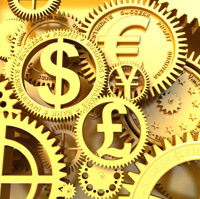 Whether in response to direct U.S. government maneuvers or as a result of inevitable economic maturation, the dollar has been shaken by financial globalization. Apocalyptic predictions have the dollar free-falling to a sudden collapse21, while moderate ideologues and economists point to the predictable balancing22 of a more ideally diversified global economy. Progressive Policy Institute, “Bush vs Clinton: An Economic Performance Index,” Robert D. Atkinson and Julie Hutto, October 2004. U.S. News and World Report, “President Bush’s Tax Cut Suicide,” James Pethokoukis, March 2007. Pacific News Service, “Watch the Dollar: Bush Needs a Lesson in Currency and History,” Franz Schurmann, Feb 2003. Progressive Policy Institute, Atkinson and Hutto. Federal Reserve Bank of San Francisco, “What if Foreign Governments Diversified Their Reserves?” Diego Valderrama, July 2005. “U.S. Business Blames Poor Economy on Chinese Yuan’s Fixed Dollar Value,” Elizabeth Becker and Edmund Andrews, Aug 2003. European Central Bank, “The Accumulation of Foreign Reserves,” Feb. 2006. Market Watch, “Dollar Hits 14-Year Sterling Low; Euro/Yen at New Record,” Wanfeng Zhou, Jan 2007. Financial Times, “Euro Notes Cash In To Overtake Dollar,” Ralph Atkins, Dec 2006. Oanda, FXHistory: Historical Currency Exchange Rates. MSNBC, “Consumers Could Get Caught Under Falling Dollar,” Martin Wolk, Dec 2004. “Will the Euro Eventually Surpass the Dollar as Leading International Reserve Currency?” Menzie Chinn, Jeffrey Frankel, Jan 2006. Bullion Vault, “A Beauty Contest for Misshapen Half-wits,” Adrian Ash, Dec. 2006. Federal Reserve Bank of San Francisco, Valderrama. World Net Daily, “U.S. 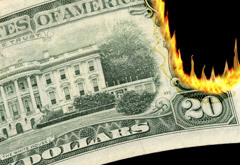 Dollar Facing Imminent Collapse?” Jerome Corsi, Dec 2006. The Economist, “Sustaining the Unsustainable,” March 2007. JP Morgan compared Thailand to Korea in 2004. In October 2004, the Korean won started a sharp appreciation. [That year] Korea outperform emerging markets by 20 per cent in 2005, and Asia Pacific excluding Japan by 30 per cent. Analysts will also be watching for any changes to the Fed’s inflation outlook, particularly after Friday’s stronger-than-expected consumer-price report. Recently, sharp falls on equity markets…had sparked some unwinding of carry trades. Investors have begun the week by resuming them following firm US inflation data last week and solid gains in equity markets. If global imbalances are the result of such frictions, they are unlikely to unwind quickly. Financial systems, after all, do not mature overnight. The State Administration of Foreign Exchange will run the daily operation of the country’s forex reserves, while the new forex investment company, under the State Council, will run the investment side. Currency flow data showed that institutional investors had amassed massive short yen positions in the last six months at an average rate of about Y119.70 against the dollar. At the current rate, they would take until April 30 to be squared. Forecasting the value of currencies has always been more art than science. Nevertheless, JP Morgan, an American investment bank, has undertaken the most ambitious project of developing a set of 3-month and 12-month forecasts for many of the world’s currencies. Overall, JP Morgan is predicting a modest decline in the Dollar over the next 3 months against most of the world’s majors, perhaps due to declining economic prospects. Over the following 9 months, however, the USD is forecasted to gain ground, finishing the year above where it started. The forecasts are relatively conservative, with the exception of the Chinese Yuan, which is predicted to rise almost 20% against the USD in the next 12 months. Considering the Yuan rose by less than 4% in 2006, this is a lofty prediction indeed! The majority of this blog’s content is focused around events which potentially impact forex markets, paying scant attention to the trading, itself. I would like to offer a quick primer to those of you who are new to forex trading and simultaneously a refresher to those who consider themselves veteran traders. First, when trading currencies, it is important to develop a consistent, cohesive strategy, and stick to it. Success and profits are most likely to be earned by honing a single strategy, such as interest-rate arbitrage, changes in geopolitics, or technical analysis, to name a few. It is most worthwhile to approach trading from one particular framework, and practice discipline in adhering to a corresponding strategy by working towards understanding if/how the markets move within that framework. Next, think twice about short-term trading. Those most likely to profit from day-trading currencies probably have more capital, more leverage, and access to better information. It is difficult to compete with these investors, and it makes more sense to stake out a position over the course of weeks or months, than minutes or hours. Finally, establish a risk/reward profile that you wish to target, and work to understand how volatility, which is a readily obtainable statistic, bears on this schema. If, for example, the markets suddenly become volatile (as is currently the case), it probably doesn’t make sense to set up stops (which automatically execute trades to minimize losses) since prices may move rapidly back and forth through the price points that you set, locking in losses. Now, locked in a reverse vicious cycle, the rapid unwinding of carry trades has applied upward pressure on the yen, compelling other investors to reduce positions on carry trades and enticing speculative currency traders to buy yen.